FEMA is the primary federal agency for funding assistance after a disaster. Congress appropriates money annually into FEMA’s Disaster Relief Fund (DRF). After presidentially declared disasters, FEMA uses this money to fund three programs: (1) Public Assistance – used to repair and rebuild local government buildings and infrastructure; (2) Individual Assistance – funds to help individuals with essential home repairs, temporary housing costs, and other necessary expenses; and (3) the Hazard Mitigation Grant Program – funds for reducing future disaster losses through mitigation measures such as property buyouts and home elevations. For severe disasters or years with multiple disasters, Congress may decide that the funds available from annual appropriations to the DRF are insufficient and will pass supplemental legislation appropriating additional money. Funding to the DRF by fiscal year is shown in the figure below. 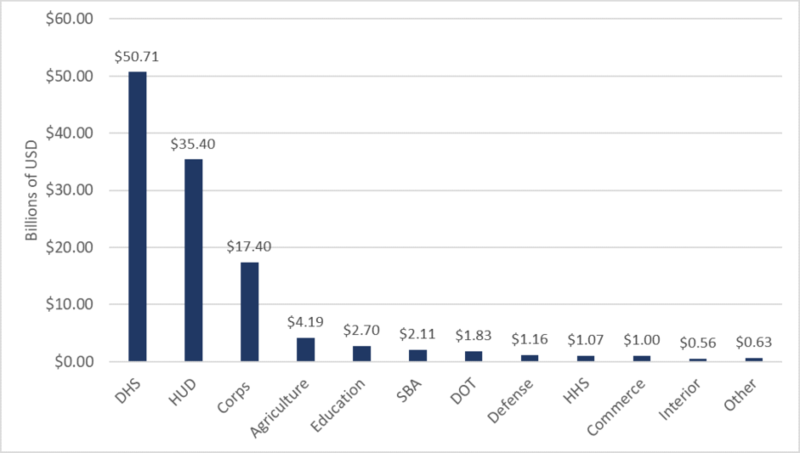 As seen in the figure, annual appropriations routinely fall far below the money FEMA spends on disaster response. Note that supplemental appropriations may be made to address disasters occurring in previous years. Supplemental appropriations made in FY 2018 and FY 2017 were provided in response to the 2017 disasters, making 2017 one of FEMA’s costliest. The figure below shows the allocations by department for all appropriations for the 2017 events (September, October, and February bills), but excludes the debt forgiveness of the flood insurance program. The total is about $120 billion. The Department of Homeland Security (DHS) received the most funding at over $50 billion, with most going to FEMA. 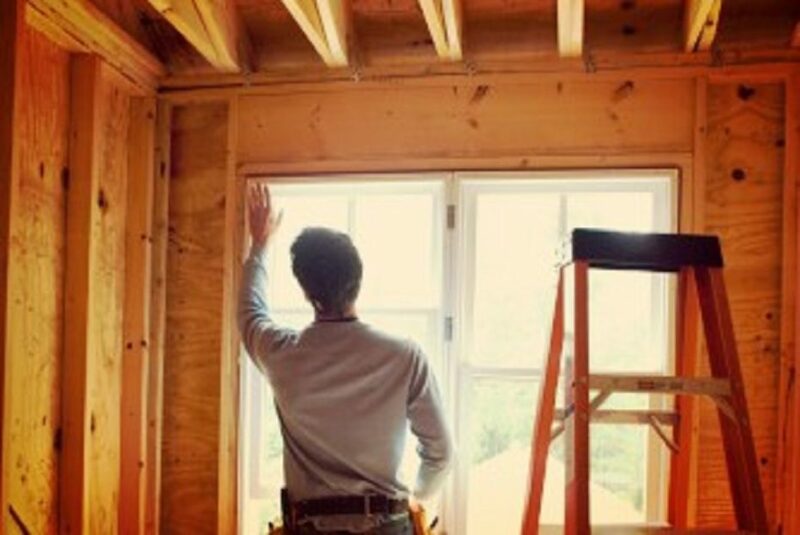 The Department of Housing and Urban Development (HUD) received over $35 billion – the second largest appropriation – to fund the Community Development Block Grant – Disaster Relief Program (CDBG-DR). Since September 11th, 2001, Congress has regularly directed supplemental dollars to CDBG-DR, a flexible program that allows the recipient state and local governments to develop their own action plans for how to spend the money, within some broad requirements and guidelines set by HUD. Some things to note about these appropriations. The first is that while FEMA and other agencies provide some funding immediately after an event to assist in response and short-term recovery, most of the dollars are for long-term rebuilding. Consider that the $90 billion in disaster funding was appropriated roughly 6 months after the events. By the time that funding works its way from Treasury, to the agencies, to the state and local governments, and, if applicable, to residents or businesses, it can be months or years after the disaster. While there are funds available for households, much of the funding is for repairing and rebuilding public facilities and infrastructure. Consider DHS funding. From 2000 to 2013, the PA program accounted for 47% of all DRF obligations, the Fund’s single largest category. The IA program (25% of DRF obligations over that period) provides funds to households, but much of the aid is for immediate post disaster needs and the total is capped at $34,000, with the average award providing only about $5,000 per household. The primary post-disaster support for households is a loan from the Small Business Administration. Supplemental appropriations are also often used to fund greater investments in risk reduction. HMGP is a standing program in FEMA to do this, but program funds are limited. In the most recent appropriation of $90 billion, Congress and agencies have explicitly directed funding to future risk reduction beyond HMGP. Congress provided approximately $12 billion for risk reduction through HUD’s CDBG-DR program and about $16.5 billion for Corps of Engineers flood and storm damage reduction projects. This is roughly 30% of the total as seen in the figure below. HUD mitigation funds are available to CDBG-DR grantees impacted by major disasters occurring in 2017, 2016, and 2015. Corps funding provides $15 billion to construct flood and storm damage reduction projects in states that received more than one flood-related major disaster declaration in calendar years 2014 – 2017 and $10.425 billion of those funds are specifically dedicated to states and territories impacted by Hurricanes Harvey, Irma, or Maria. This continues the federal government’s trend of allocating its risk reduction dollars post-disaster, tied to a Presidential disaster declaration, and spending little ahead of time. 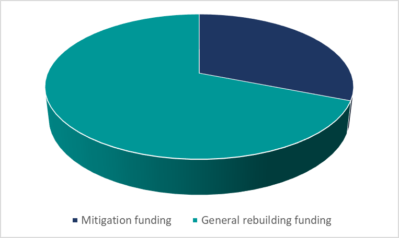 An analysis of federal spending found that over 90% of federal flood risk reduction funds are tied to specific presidential disaster declarations and appropriated in supplemental legislation. 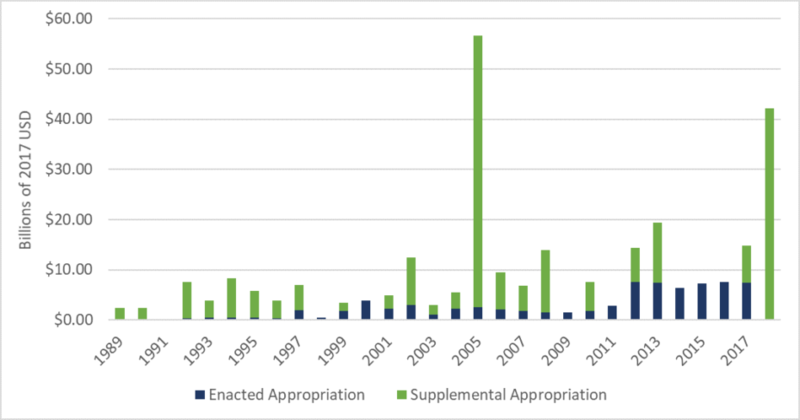 President Trump’s FY 2019 budget request for the DRF is the lowest it has been since 2014, although the administration supported the recent supplemental appropriations.